A beautiful home doesn’t have to be large or expensive to be charming. 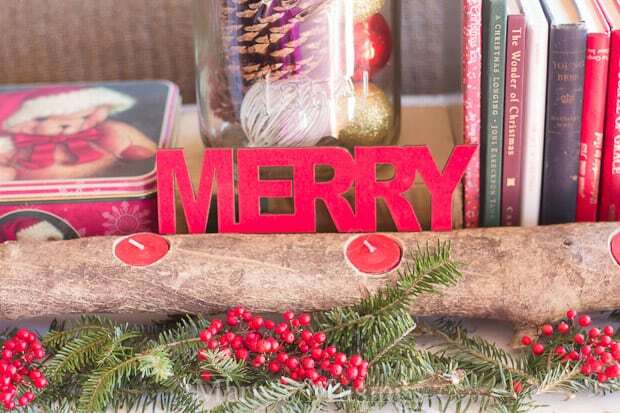 This Christmas home tour is filled with thrifty home decor and easy DIY crafts and projects! 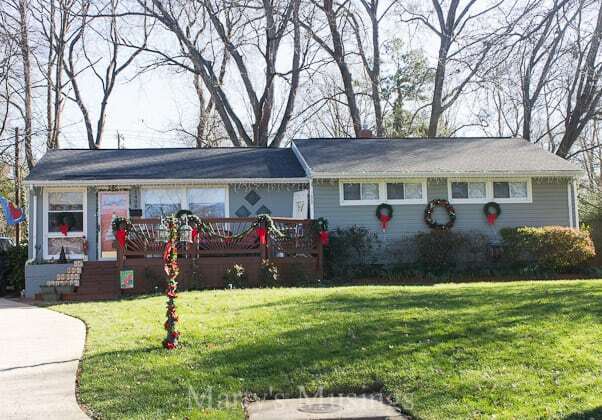 Why yes, I am a little bit late sharing my Christmas home tour this year. What? You haven’t heard the news? My DIY hubby had rotator cuff surgery and my first grandbaby was born the very next day, four weeks premature. Aiden James Baldridge weighed in at 7 pounds 6 ounces and was ready to make his grand entrance! For this planner and list checker offer (what? never heard of that either?) this season of surprises has challenged me. I have struggled with my many blog to dos. Projects completed and pictures taken but not enough time to sit down at the computer and share them with you. When your blog is your business and now the sole source of income for your family, this is stressful! I wrote all these wonderful tips for handling stress at Christmas and completely ignored my own advice. Something along the lines of “do what I say and not what I do” hypocrisy. But my youngest kids stepped up and helped out and have learned that life looks different right now with daddy home 24/7 and mommy working full time. That’s okay. We’re being stretched in ways that will only make us stronger in the big picture. So today I’m going to pretend you are all sitting on our comfy old sofa and sharing a cup of Instant Russian Tea with me while I share my best tips for a perfectly imperfect Christmas home! Tip One: Relax and have fun! Well, maybe not all of you can visit at once, but do come on in and set a spell! This is our first year decorating our new front deck. Tim is in charge of the outside decorating for the most part but I got the stairs! 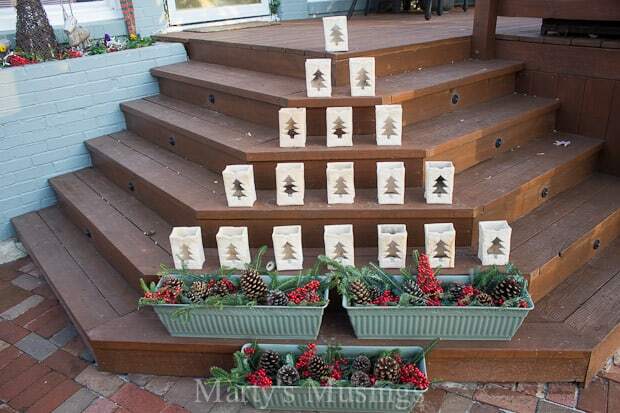 You can read more about our Christmas tree luminaries and see the rest of the deck decor here. 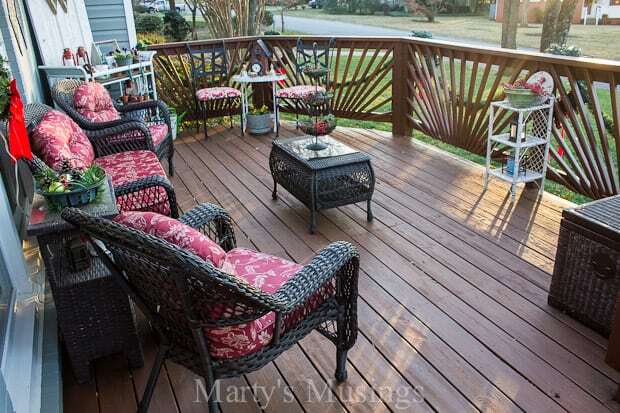 I love that our deck is just like the inside of our home, comfy, inviting and full of yard sale treasures and repurposing projects. 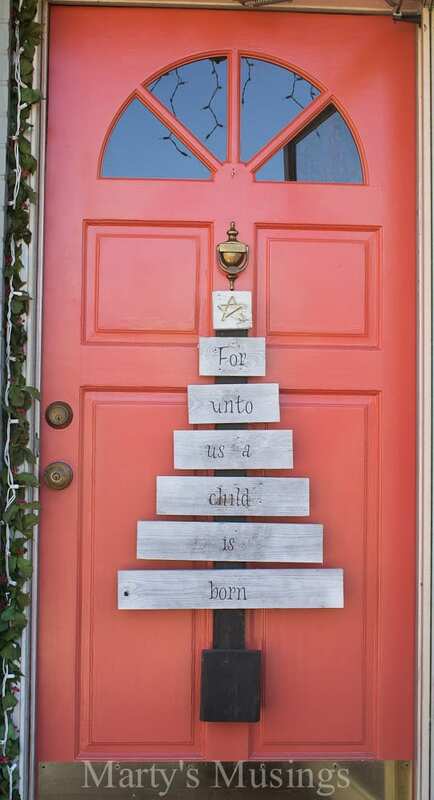 Tip Two: Use a non traditional item on the front door. I love my fence board Christmas tree in the place of a wreath. This was my hubby’s great idea but only because he got to it first! 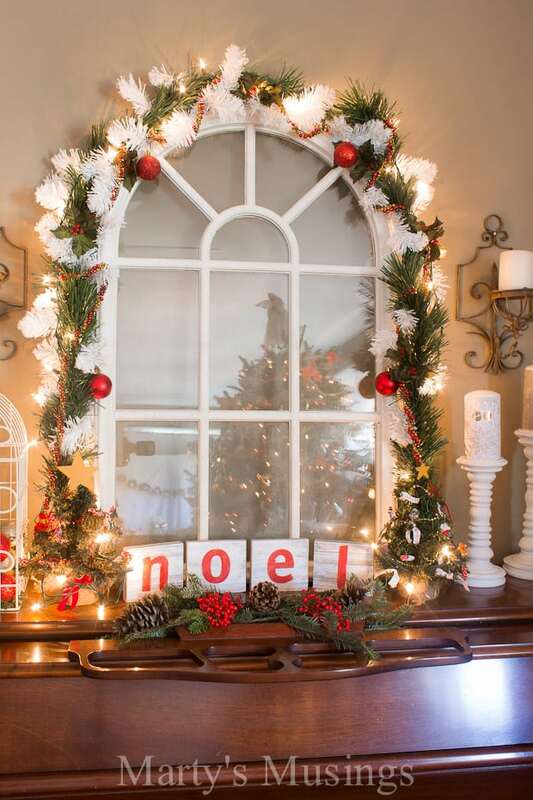 Tip Three: Use a high impact display right inside the front door. 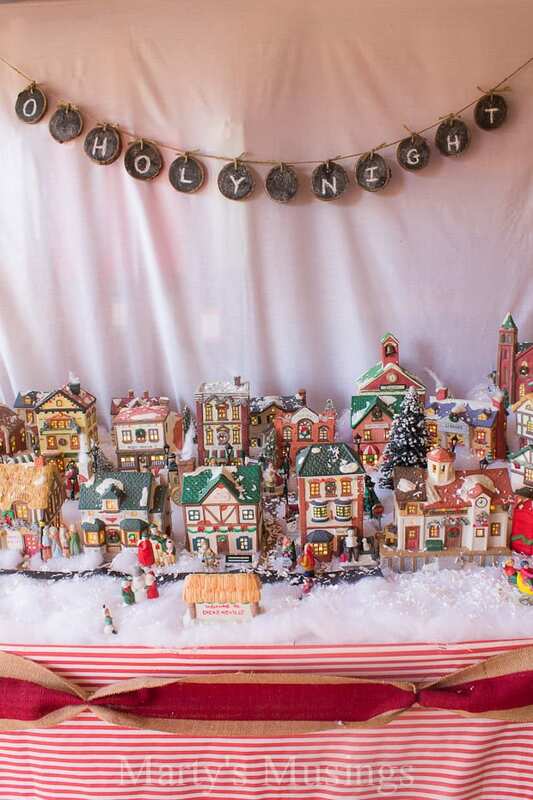 Our little village welcomes visitors of all sizes! It looks great day or night and is a unique way we greet guests to our home. 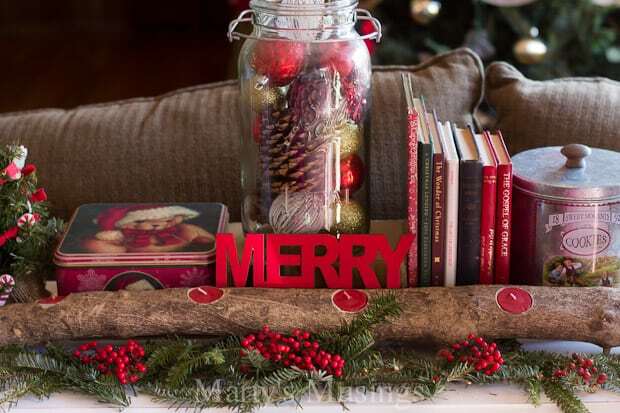 Tip Four: Create vignettes from inexpensive items found around the house. To the right of the village is the table my son scavenged for me off the curb and I chalk painted white. I just adore it! 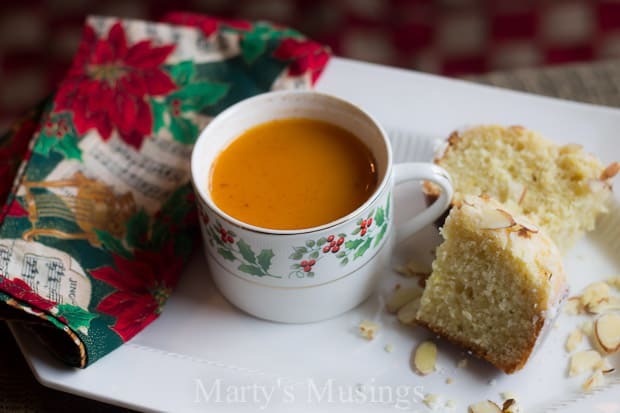 This vignette transitioned from fall to Christmas with just a few changes. 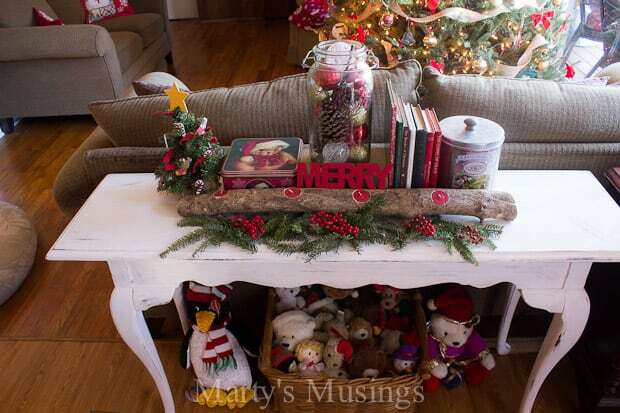 I kept the branch candle centerpiece as the base and added greenery, berries and red tea light candles. 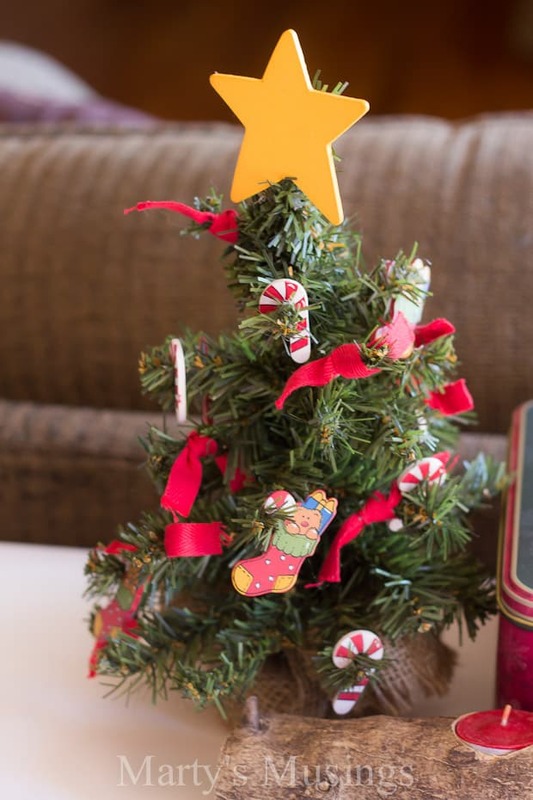 The little “merry” sign cost a quarter after Christmas one year at the craft store. 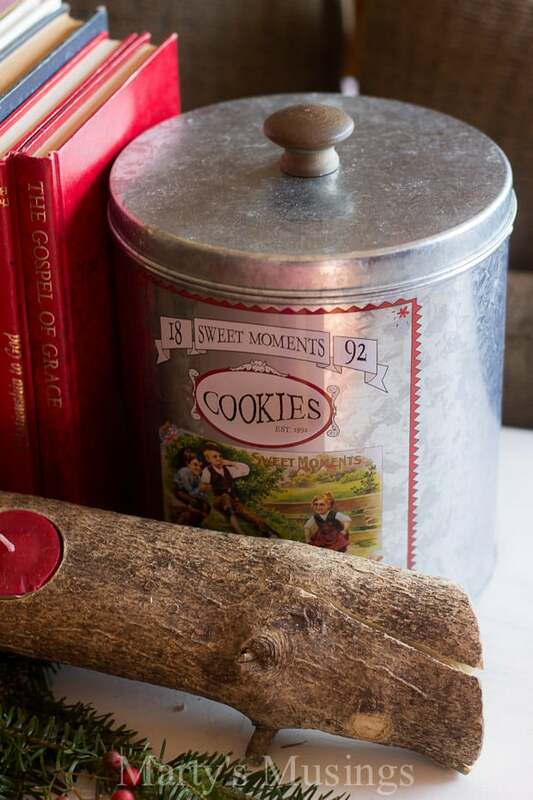 This little silver cookie tin was a dollar yard sale purchase and I’m so happy I found the perfect place for it! 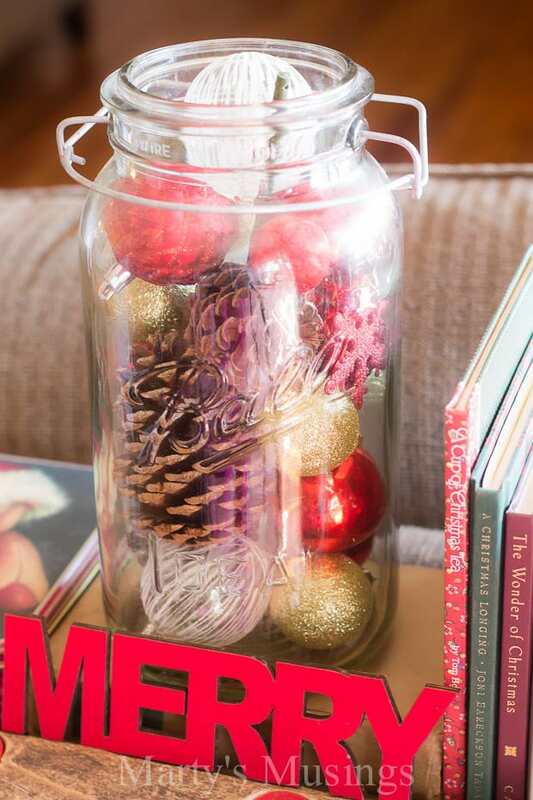 What could be simpler than an oversized mason jar filled with ornaments and pine cones? 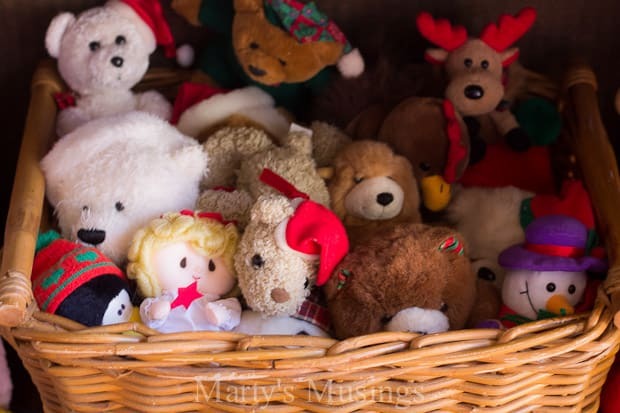 Underneath the table I have a basket of Christmas stuffed animals that are ready for our new grandson to play with. Since he’s only a week old I guess he’ll have to wait until next year! 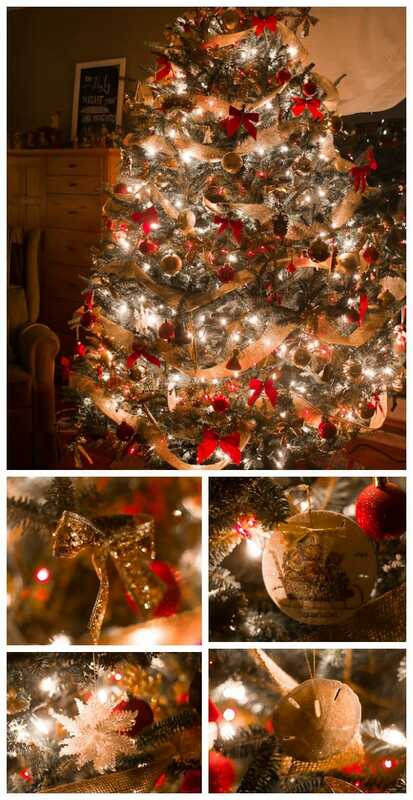 Tip Five: Make your Christmas tree personal AND beautiful! 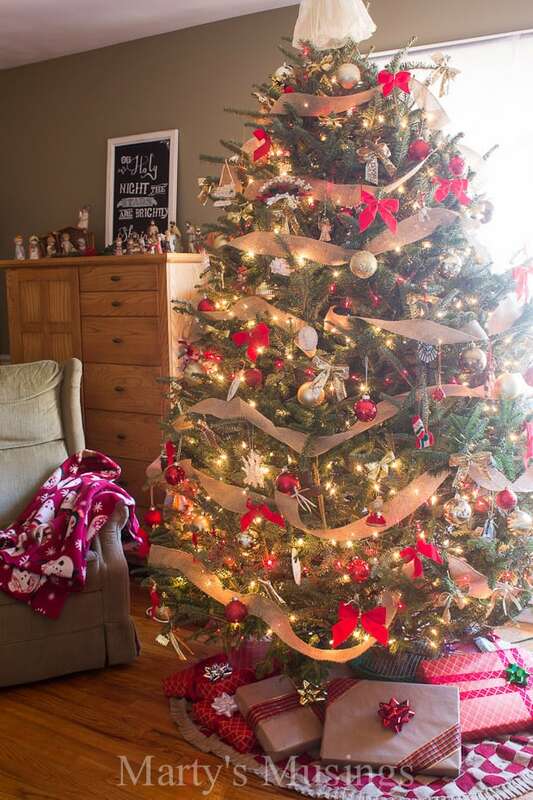 Our tree was decorated with love and the joy of family traditions and experiences shared through the years. It’s not designer perfect but it’s “perfectly imperfect” for us! 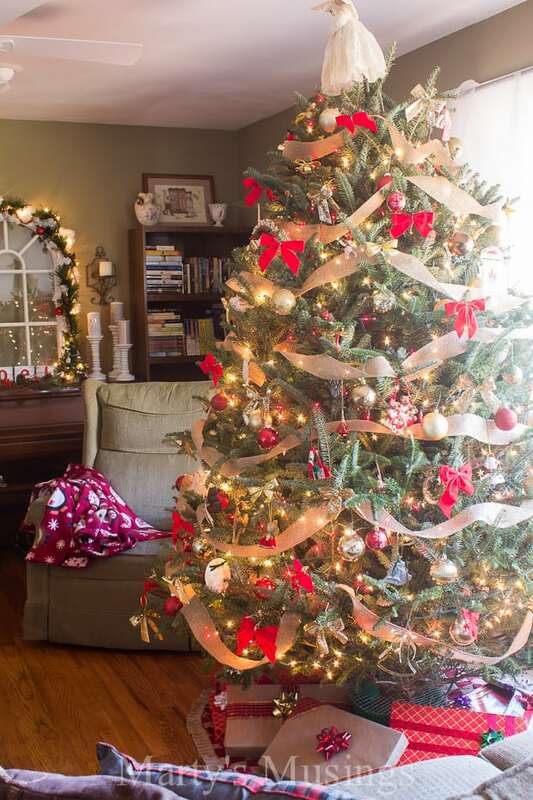 Tim and I love to sit by the tree in the mornings and try and resist the urge to move the ornaments around and straighten the bows. He actually asked our married children if they would rather us do the tree by ourselves, and you should have seen their shocked faces. Rachel informed him that it’s still her tree, too, even if she’s married now with her own family. One family tradition intact for years to come! Last year after Christmas I bought several strands of white garlands for dirt cheap and knew I wanted to somehow use them with my $10 yard sale window. I passed the task on to my hubby and he wrapped and adorned it beautifully. My son wrapped a strand of lights around the window and I called it amazing! 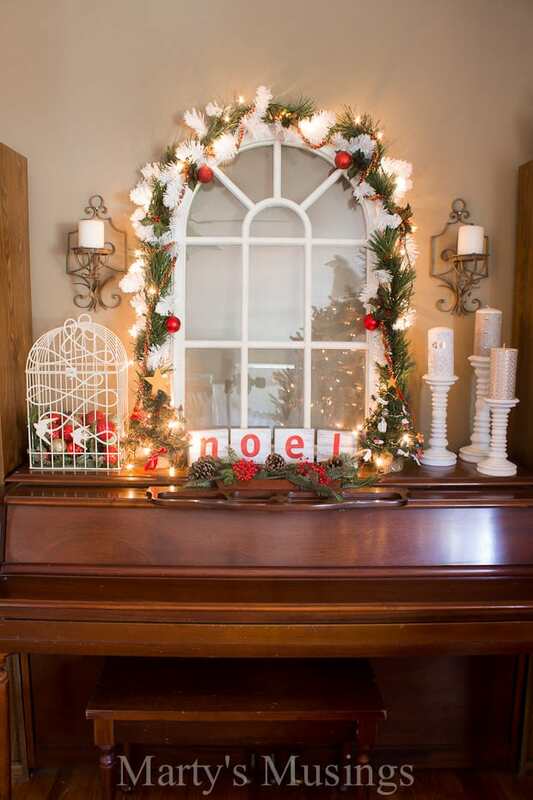 The Noel blocks are just like the ones on this wreath and anchor the vignette along with more greenery, berries and pine cones. 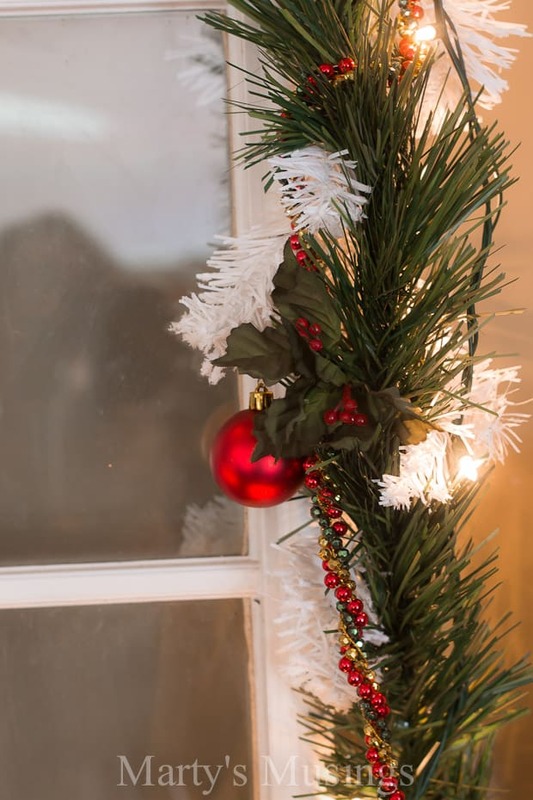 See how simple this garland is? I just love it! The bird cage I also picked up this summer for a couple of bucks and I used marked down ornaments collected over the years at after Christmas sales and the dollar store nestled in a bed of greenery. 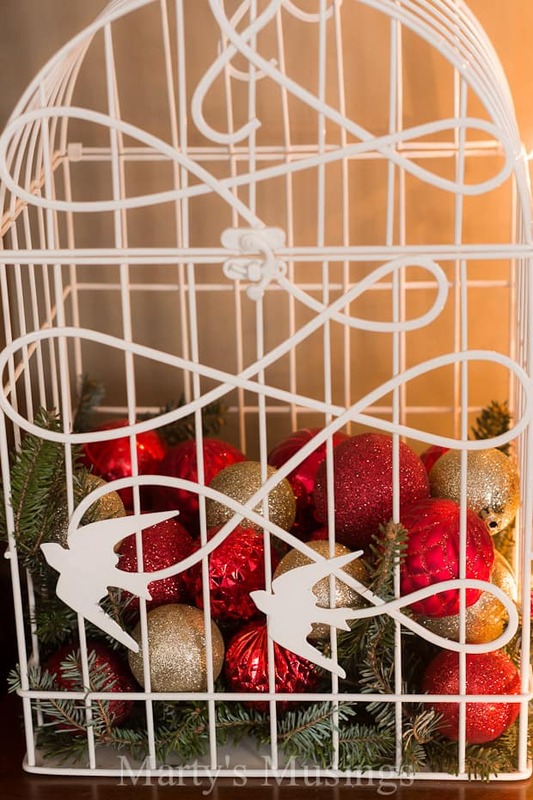 Tip Six: Use fresh greenery and natural elements mingled with inexpensive decorations. Let me just say that all the fresh greenery was given to us when we bought our real Christmas tree. Ask if you can have a few branches and you can accent your whole house! 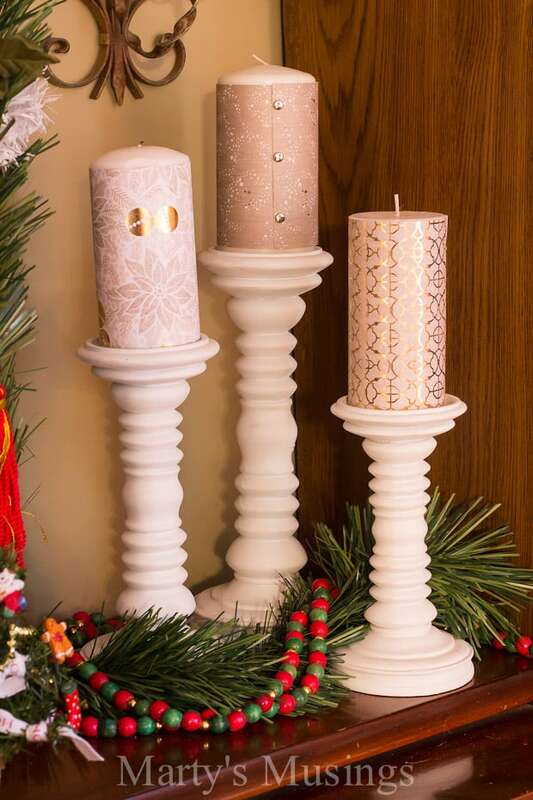 These candle wraps were a 5 minute Christmas craft project (read all about it here) that was so easy AND inexpensive! 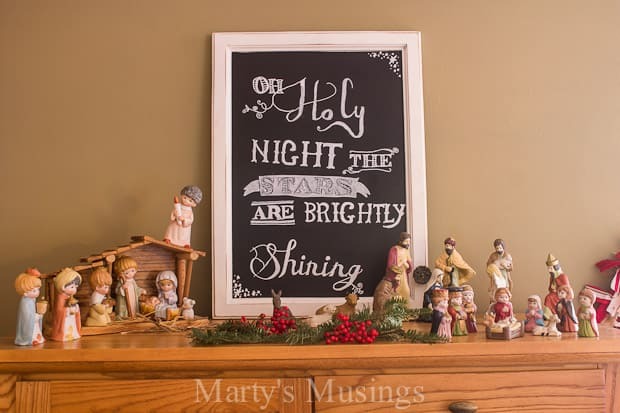 My daughter wrote out the words on our chalkboard to go along with our collection of nativities. Love this little Precious Memories collection from my husband’s childhood. 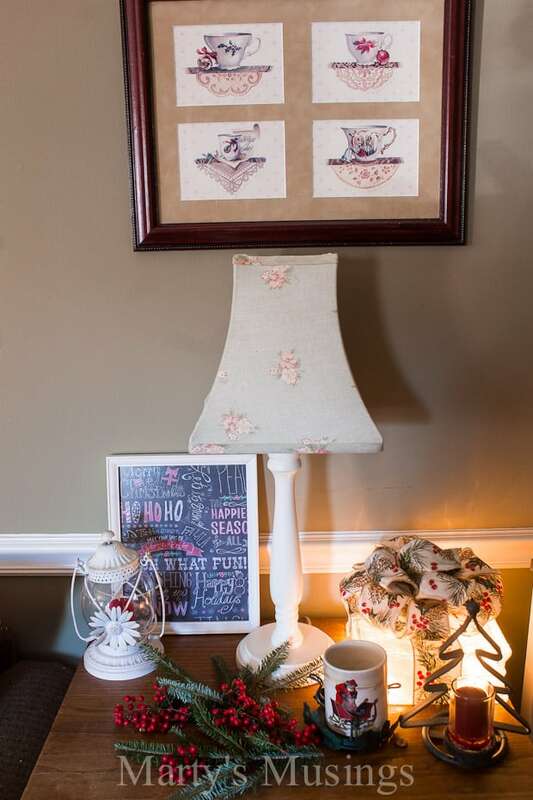 This simple vignette contains a frame with a sheet of seasonal patterned cardstock, a light that was a Christmas present from long ago and other inexpensive goodies. Remember: your decor doesn’t have to be expensive to be beautiful! Below you can see a new project where the pallet shelves used to hang. Yet another yardsale purchase that I’ll give you the details on later. I love the simplicity of this arrangement and am going to have fun changing out the decor as the seasons change. 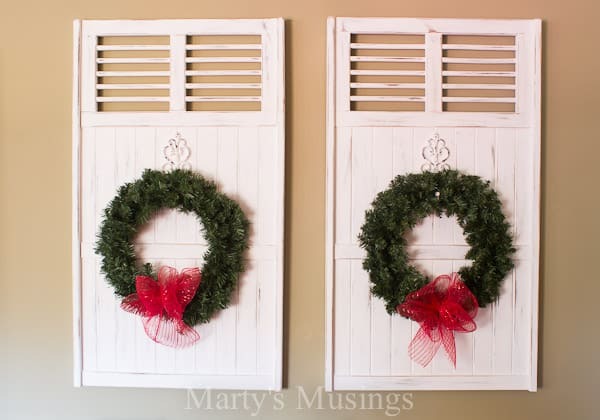 Can you believe both shutters were a dollar? And they came with two brushed metal flower containers, too! Nothing says Christmas like the twinkling lights of the tree at night. Last year I deviated from our usual routine and replaced strands of beads with burlap garland. You would have thought we had a mutiny on our hands! I persevered and this year I replaced our 25 year old tree skirt with a burlap weaved one. 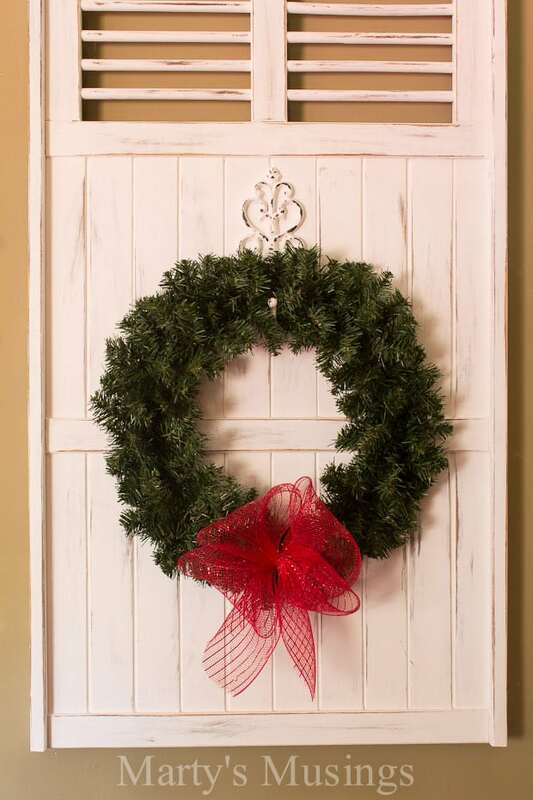 I had every intention of DIY’ing it but when I saw this one on sale for half price at Hobby Lobby I was all over it! I love to personalize as much of my home as possible but sometimes you just have to draw the line! This $20 beauty was worth every penny! Our den on the back of our house has many functions right now: Tim’s bed and recovery room; my office; family TV hangout and more. 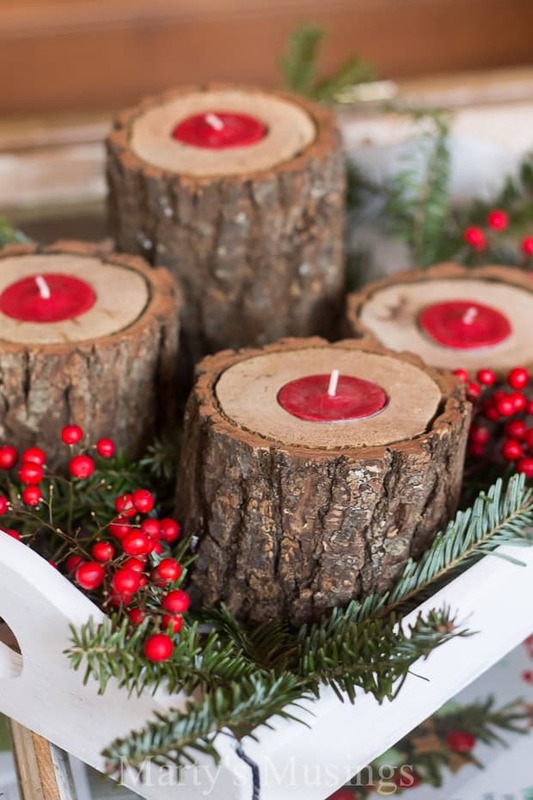 My favorite project in this room is these rustic wood candle holders. 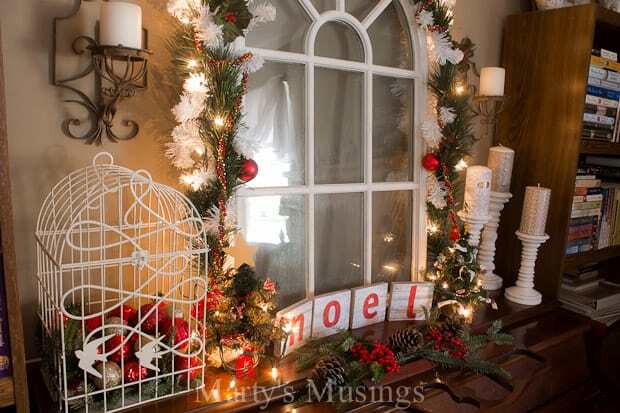 That’s all of the Christmas home tour for now but I’ll be back to share my aqua and red Christmas tablescape and hutch. It’s a gorgeous color combination! 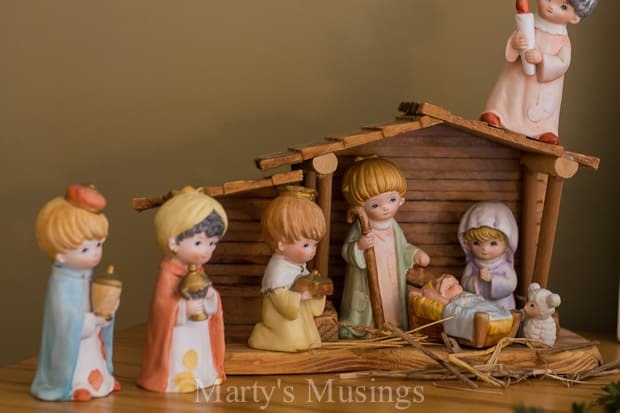 You might enjoy my recent posts what no one wants to talk about at Christmas or these practical tips for surviving the holidays. Thank you for letting us into your beautifully decorated home! 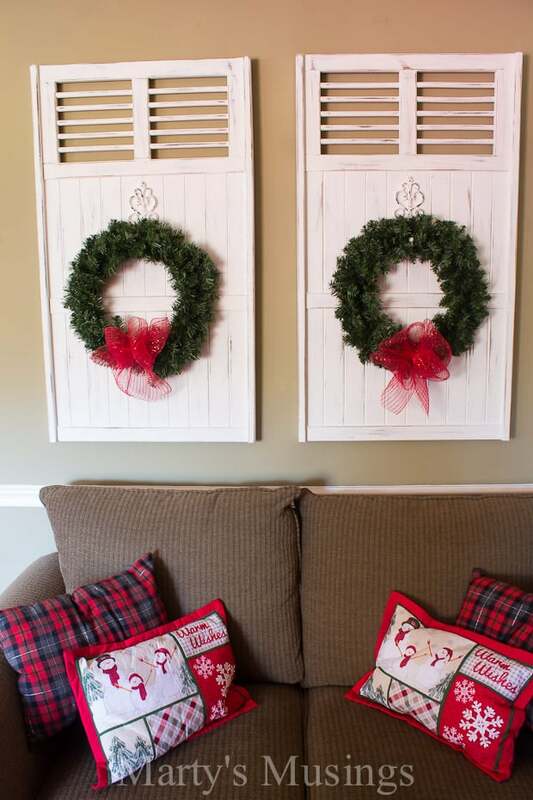 I love how you use DIY and yard sale (and road side) finds to decorate your home! Hope your husband is recovering well…and congratulations on your 1st grandchild! They are GREAT…I have SIX of them!!! Enjoy your day!!! Hi, Barbara. Thanks for touring my Christmas home! I do love finding treasures for free or inexpensively! Congrats on YOUR 6 grandkids. Such a blessing! 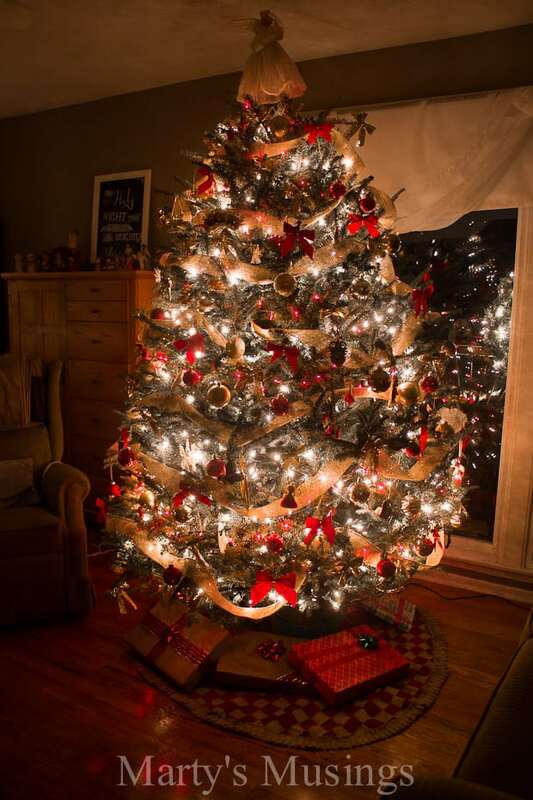 You have a lovely home- and your tree is gorgeous! Thank you so much, Stephanie. I’m in the midst of Christmas decorating and the house is a mess! I need to remember it is for enjoyment and beauty! Wow! Beautiful and what a great list of ideas to handle the stress~ Thanks for sharing on Throwback Thursday! 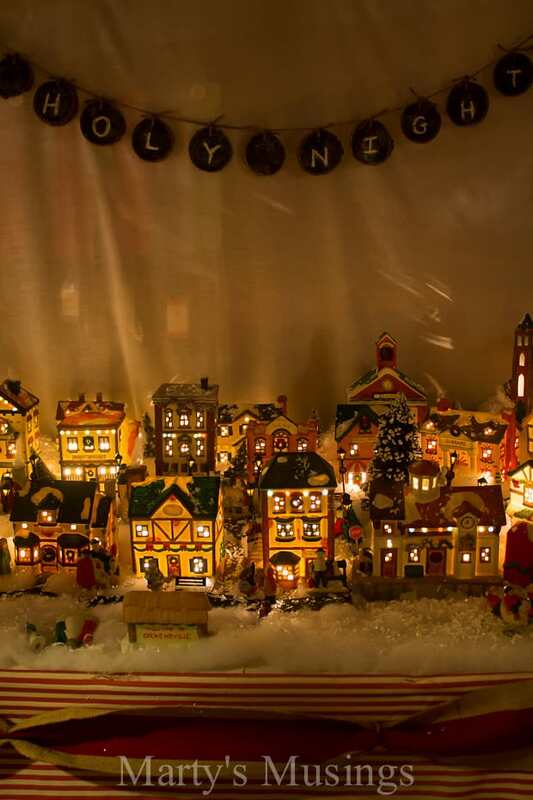 Everything is so beautiful, thanks for sharing, and giving ideals to us to change out our decorations each year. Thanks so much, Peggy! I’m glad you enjoyed my Christmas tour. 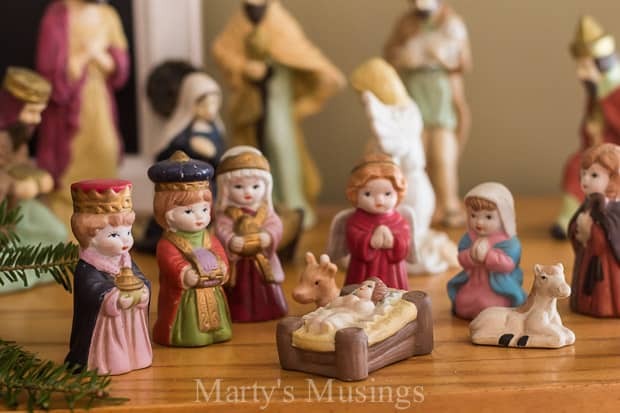 I continue to learn how to simplify and make decorating easier each year. Have a blessed holiday season! This is so beautiful, Marty! It’s really put me in the Christmas spirit already and given me some lovely ideas!